I’ve been trying to get back into painting again. I’ve created art in fits and starts for most of my life. Like most kids, I enjoyed drawing and painting in art class just for fun. I dabbled a bit with watercolors in college, before getting frustrated with not making enough progress, and stopping. Then for a couple years, I discovered the beauty and portability of colored pencils. Colored pencils give me the control I like, but the artwork can be time consuming. And again I wasn’t making the progress I hoped, so I gave it up. About a year and a half ago, I decided to take it up again. This time, I decided to go with a mixture of watercolor pencils and pastels. I like the combination both bring to create artwork. Watercolor pencils give you the control and precision of wax colored pencils, but they also can be used for the color diffusion of watercolor paints. I like to draw the painting out and then follow up with water to blend the colors. Pastels are a great way to render diffuse, bold color, particularly for landscape paintings. 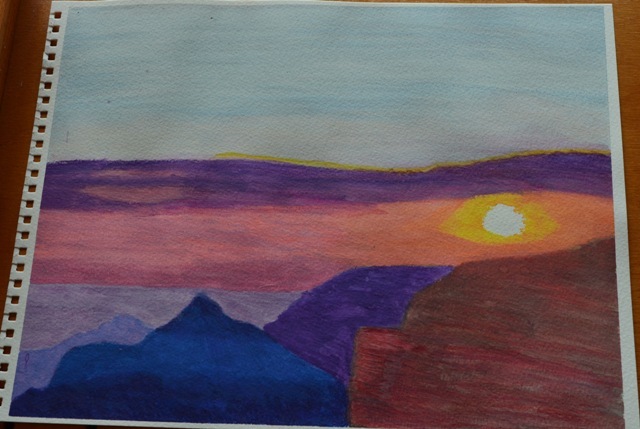 For this painting, I selected a reference photo of a sunset I took at Grand Canyon North at Cape Royal during my vacation there this past summer (see below). I felt it was a good picture to start with. I found it very beautiful, with bright colors- just like the paintings I want to create, and the paintings I appreciate as a collector. Plus, I felt it would be relatively easy to render, since sunsets seem to be easier. What I will say about this painting is that- it’s not BAD for a first effort after months of not painting. It certainly could be worse. I’ve done better sunsets in the past, but something about this painting just didn’t work for me. Maybe it would have been better to render it in pastel, as watercolor sort of seemed to blend all the colors into one big patch, rather than the separate, distinct colorful clouds and sun from the reference photo. Or I should have been more disciplined in the drawing of the clouds. And the use of watercolor for the canyons just didn’t really come out like I hoped. The distant shadows were okay, but the closer canyons weren’t really distinct or detailed. Again, pastels might have been a better choice to render the shadows of the stones and the vegetation of the canyons. When I first took the painting in after I decided I was finished, I was rather disappointed. I had this image in my head of how I would be able to correctly recreate the reference photo as a painting. While the painting captured the general use of color from the photo, the overall effect was flat. There was no dimensional shadowing or distinct clouds. There was no depth or real artistry. But as what usually happens, the more time passed and the more I could take it in, I started to appreciate it more. Sure, it wasn’t what I envisioned in my head. But there is a colorful beauty there, and not all artwork must be 100% representational to be enjoyed. Think of it like a first draft of a writer’s novel. It may not be what I want it to be right now, but nobody starts out being a really good artist. It takes work, lots and lots of work to become a quality artist. Inevitably in that work journey, there will be efforts that don’t exactly thrill you, but still can teach you something, and you can still take away something from the creation to make future work better. I have to constantly fight against the internal voice that tells me if I am not instantly good at something, it isn’t worth working harder to become better at it. So while this painting is not what I hoped it would be, it’s representative of a first step toward becoming a better (maybe one day, professional) artist. Below is the reference photo I took of the sunset. 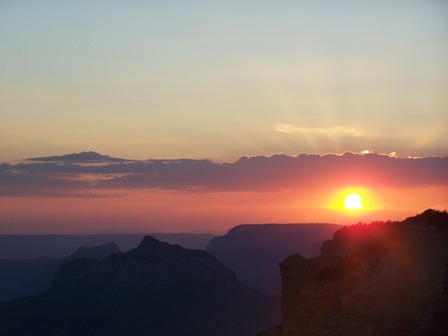 I visited Grand Canyon North in August 2011. This was my first night in the area, and I drove out to Cape Royal, because I knew the sunsets were supposed to be amazing. It was very peaceful to sit out at the viewpoint and watch the sun melt into a variety of blazing colors and paint itself across the canyons. It’s times like these on vacations when I am reminded again and again how much beauty there really is in this world, and it is this beauty that inspires me to be an artist.